When Apple removed the headphone socket from the iPhone 7, they promised us they had a solution in the works. That solution is wireless audio using the company’s new W1 standard, and we’re happy to report that the technology is sound. But the AirPods aren’t the only pair of headphones that make use of the new standard. Since Apple bought Beats, there are several other models that offer great wireless sound and impressive battery life. So are the AirPods really worth it? Or should you spend your money elsewhere? EarPods + Courage = AirPods? When it comes to personal audio, you’ll be forgiven for shying away from wireless solutions. Old Bluetooth audio standards used aggressive compression that made your music sound bad, while even the newest Bluetooth headphones are chunky by design. Then you have to charge them and sync them. Apple’s W1 chip fixes most of those problems. It’s the best wireless audio standard I’ve ever heard, proximity-based pairing means they sync in record time, and low power demands allow for lightweight designs that charge in record time. These praises extend not only to the AirPods, but the BeatsX and Apple’s other W1-based headphones too. While the move to wireless is a significant one, there aren’t many other major changes compared to the free EarPods Apple provides with every new iPhone purchased. Oh wait, there is one other small matter to consider: they cost $159. In the box you’ll find a small round plastic case, inside which are two AirPods. There’s also the usual Apple literature, a sticker, quick start guide, and USB-A to Lightning cable. The case in which the AirPods arrive is central to their design and operation. The pocket-sized glossy white flip-top container has just enough space for both earphones, but also houses a battery which starts to charge the AirPods the second they enter the case. This battery enables a total of 24 hours listening time, but you’ll need to place the EarPods into the case in order to charge them a few times while doing so. A Lightning port on the bottom of the case allows you to charge the vessel and its contents using a spare iPhone charger, and the hinge makes a satisfying snap when closed. Overall build quality is typical of Apple. The case feels like it will last, and there’s not a sharp corner in sight. Dropping the AirPods into the case is easy, with magnets to guide you. While the case is pretty hard and is sure to protect the earphones, it feels like it might be a little on the brittle side when it comes to hard drops. Design-wise the earphones themselves are identical to free EarPods, except they don’t have any wires at all. Each AirPod sits in your ear and protrudes slightly. They have a longer “stem” than a standard pair of earphones, in which the battery and communications are housed. It’s a unique look that’s bound to divide opinion. I’m sure they’ll look a little less ridiculous in a year, once we’ve all gotten used to seeing them in the wild. On the upside, they really are wireless headphones — unlike their main rivals the BeatsX BeatsX Review & Giveaway: Apple's Best Earphones Yet? BeatsX Review & Giveaway: Apple's Best Earphones Yet? Read More which still use a “necklace” design. In terms of comfort, they’re not great. If you’re not fond of Apple’s free EarPods that came with your iPhone, you won’t like the AirPods. They feel identical to EarPods since they share the same loose, non-fitted hard plastic design. There’s no silicon earbuds to ensure a tight fit, no passive sound isolation – just a one-size-fits-all approach. The problem is that one size does not fit all. The hard plastic can be uncomfortable after long periods of use, and they never really form a great seal. This is going to be the deciding factor for most people, more so than how they actually sound. There’s a marginal improvement in sound over Apple’s EarPods, which are typical middle-of-the-road headphones Sound Advice: Are Apple's Free EarPods Really That Bad? Sound Advice: Are Apple's Free EarPods Really That Bad? Apple's free earphones have a reputation being utter garbage — but are we being too harsh on the pearly white fashion accessories? Read More . There’s more detail in the mid and high ranges, though it’s debatable whether they sound like a $160 pair of headphones should. A fitted silicone design would likely improve perceived quality and bass response by means of passive sound isolation. On the plus side, you can test out your own EarPods at home to see how comfortable you find them and whether the sound is up to par. You can then decide whether the jump to wireless audio and a few extra smart features are really worth the money to you. They’re not as heavy handed with lower frequencies like the BeatsX are, so they’re better suited to non-electronic music. Just like EarPods, AirPods are very leaky so you should expect whoever is sitting next to your on the tram to be able to hear your music too — even at low volumes. Overall the sound quality is passable — good enough for listening to compressed streams and lossy MP3s, but they won’t knock your socks off. The other thing that the W1 chip enables is hassle-free pairing. Simply open the AirPod case to power them up and hold it near your iPhone. A prompt will appear on-screen, and with a tap your earphones are paired. iCloud syncs the rest of your devices, like your Mac, so you can switch effortlessly between them without ever needing to re-pair. The range is great, and I was able to leave my phone in the kitchen at the back of the house and walk all the way to my front door without any degradation in quality or cut-outs. The noise cancelling Naztech Bluetooth 4.0 headphones Naztech i9BT Noise Cancelling Bluetooth Headphones Review Naztech i9BT Noise Cancelling Bluetooth Headphones Review Noise cancelling headphones are nothing new, but do the results really justify the expense? As new tech becomes old tech, you can now get noise-cancelling cans for under $100. Meet the Naztech i9BT. Read More I reviewed last year couldn’t do this, and they probably had a bigger antenna. You can also try and hunt down lost AirPods using Find My iPhone How to Find a Lost AirPod Using Just Your iPhone How to Find a Lost AirPod Using Just Your iPhone Apple's AirPods are small, which makes them easy to lose. If you can't find an AirPod, this quick method will help. 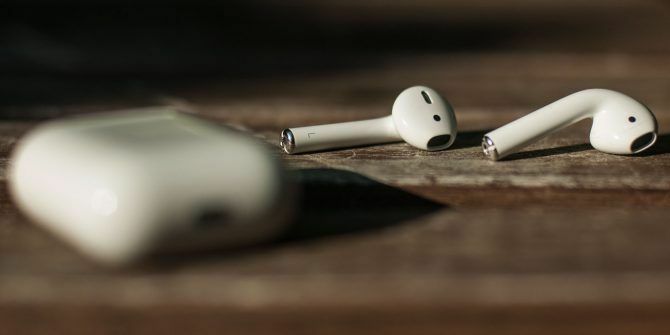 Read More if they go missing, and Apple is even happy to replace a single AirPod for $69 Apple Will Charge You $69 for Lost AirPods Apple Will Charge You $69 for Lost AirPods It's almost as if this courageous decision to ditch the headphone jack is a license for Apple to print money. But that can't be true, can it?! Read More . Despite these safeguards, the AirPods are still probably the easiest pair of headphones to lose on the market. Like the BeatsX, the AirPods are incredibly power efficient. Each AirPod is good for five hours of listening (or two hours talking) with fast charging providing the full five hours of listening time after only 15 minutes in the case. Being caught short with a flat battery is no longer the hassle it once was, and the battery case lets you charge them literally anywhere. When you control the ecosystem, you can inject your products with neat extra features. Each AirPod contains an optical sensor and accelerometer that detects when you’re wearing them. So when you place an AirPod into your ear, your iPhone will automatically route audio to your headphones. Take an AirPod out of your ear and the music will pause. Take the other one out and your AirPods will disconnect, and your iPhone will use its regular on-board speaker again. It’s a neat feature, and I’m certainly questioning why it’s taken so long to implement something like this — but it’s nowhere near as important as comfort or sound quality. You can also activate Siri by double-tapping either earphone, though this functionality doesn’t seem to work very well. There’s no hands-free “Hey, Siri” functionality Hands-Free iPhone With "Hey Siri": 4 Reasons to Start Using It Hands-Free iPhone With "Hey Siri": 4 Reasons to Start Using It Here's how Apple's hands-free "Hey Siri" command can make your life easier. Read More , despite dual beam-forming microphones providing considerably better voice recognition than the BeatsX. I did encounter a few issues though. The left AirPod wouldn’t do anything when I first opened the box, and I had to force a re-pair by holding the button on the battery case. Another occasion saw the right AirPod making the “connected” noise, but not actually connecting. The issues are few and far between on the whole though. AirPods, BeatsX, or Something Else? AirPods are expensive and divisive. They cost $160, don’t offer a huge difference in sound quality over their wired predecessors, and I found them uncomfortable. I’ve had both the BeatsX and AirPods in my possession for a short while now, and (beyond the requirements of this review) I pick up the BeatsX every time I leave the house. Even while testing the AirPods, the BeatsX were around my neck or in my bag. This says two things: I prefer the comfort and design used in the BeatsX; and that the design and smart sensors found in the AirPods did little to tempt me away from the slightly-cheaper rival model. There was one other use-case scenario I didn’t touch on: as a hands-free kit for talking on the phone, the AirPods are excellent provided your conversation won’t last more than two hours (you’ll run out of charge). You can walk around with a single AirPod in, chatting away on the phone, while still being aware of your surroundings. What do you think: are the AirPods just what you’ve been looking for? Or are they overpriced and under-engineered? Let us know what you think. Explore more about: Apple AirPods, Apple W1, Headphones, MakeUseOf Giveaway. I own both and I carry the AirPods with me every day. The case fits nicely into that little watch pocket in jeans. The convenience is great and no the wires feature is awesome. I find them quite comfortable and the sound is good enough for out and about. For me, the sensor integration is in fact more important than comfort or sound quality, or at least it outweighs any tradeoffs in those areas, which I find minor. Being able to take an Airpod out and have a conversation with someone without having to fumble around with wires is a game changer - I am using my Airpods much more often than I used my good Senheiser wired earphones. I didn't get a sticker with mine.